Flush head screw M6x14 with clip nut. Use these on overlapping flanges (like when connecting an upper and lower fairing). Flush head screw M6x14 with rubber well nut. 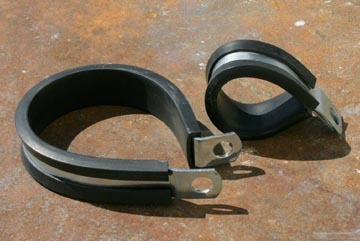 Use these on overlapping flanges (like when connecting an upper and lower fairing). As used on many OEM Ducati fairings. Can be used as a blind mount on any kind of panel, for instance when installing a fiberglass part to a metal tab or plate. Requires drilling of 1/2" hole in back panel. Grip range: up to 0.125"
These D-ring quick disconnect fasteners work great on overlapping flanges (for example the flange between an upper and a lower fairing). They look super clean and make it a breeze to take the lower fairing(s) off your bike for maintenance. The backing plates need to be riveted to the back of the inside flange. Requires a drill and a rivet gun for installation. - 2 6mm flushead screws. Plastic windscreens are notorious for cracking at their mounting points when improper mounting hardware is used. Airtech has a couple of different types of windscreen screws available that can secure a windscreen safely. Available in clear (phillips); black or white (slotted). Sold per 7, complete with nuts.